Beginning in the early 1900s, all freshman used to be required to wear the “rook green.” Men had rook “lids” (small green caps) while women wore green ribbons in their hair. Until the early 1930s, cadets also wore a green armband while in uniform. The green was worn during the weekdays and was useful for upperclassmen to identify any rooks in the area—rooks had several rules which, when violated, earned discipline carried out by the sophomore class. In the 1940s, the “rookess” ribbons were worn only on Wednesdays, and in 1960, the rook lids also switched to only Wednesdays. In a rite of passage, the freshmen would burn their green—hence the name “Burning of the Green”—at the annual Junior Weekend held at the end of may, signifying their advancement into the sophomore class. 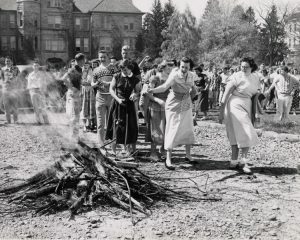 By the 1960s, the Burning of the Green had moved to Homecoming in the fall. This entry was posted in Main Page, traditions on March 23, 2012 by edmunsot.